Get the most out of the Square for Retail app — learn the best ways to find items, apply discounts, create customers, and build your cart. 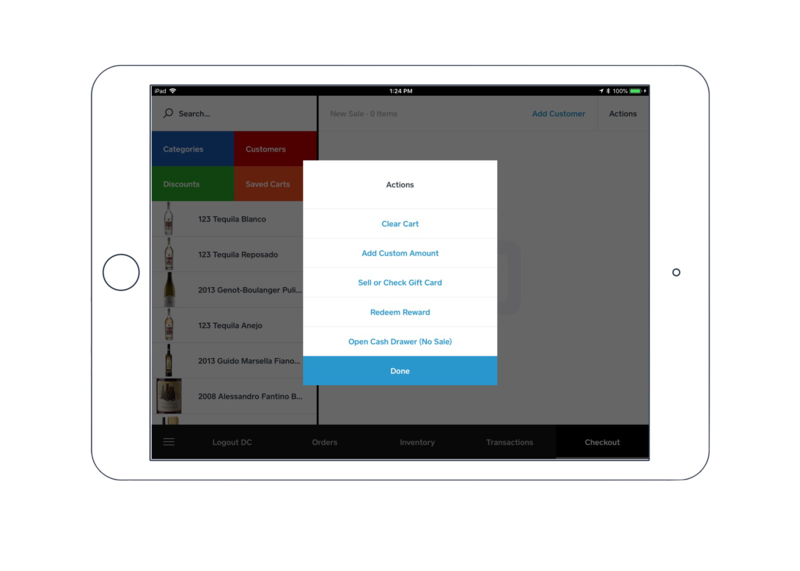 The Retail app is designed to streamline your checkout flow. To get started using the Retail app, make sure to create a device code to customize your point of sale and sign in. From the Navigation menu, the Checkout tab is where you can build your cart and accept your customer’s payment. Search through your item library, customers, and discounts. Items: Search by item category, then drill down to specific items. Customers: Create a customer from the Retail app. Customers will be added to your customer directory online. You can also add a customer to a cart to associate the sale with their profile. Discounts: Apply percentage or whole dollar discounts. Saved Carts: Add items and save a cart to check out later. The Favorites List gives you access to your most popular items in one tap, so there’s no need to manually search for every sale. Search or scroll to locate your most popular items. Select each item you would like to add to your Favorites List. The Actions menu is your back-of-house – it’s where you’ll find your application actions and settings. From the Actions menu, you have access to a number of Square for Retail features. Clear Cart: Clears all contents from the cart view. Add Custom Amount: Add a custom dollar amount to the sale without adding an item. Sell or Check Gift Card: Set up, load, and sell gift cards with just a few taps. Redeem Reward: If you send a marketing campaign with a discount or free item incentive, you can enter your customer’s reward code here. Open Cash Drawer (No Sale): Open a cash drawer without completing a cash sale. Manually search through your transaction history, search by receipt number, or enter your customer’s card number to locate a payment. You can also issue a new receipt, or process a return or exchange. Receive Stock: Receive or adjust item stock in-app. Purchase Order: Receive, adjust, or review purchase orders. Employees will see Logout with their initials on the Navigation menu. When employees tap their initials, the passcode and clock in/out page will appear. Although you can add items to your cart from the Checkout tab, you’ll need to head to the Main Menu to create items from the Retail app. From here you can create items, categories, modifiers, and discounts. 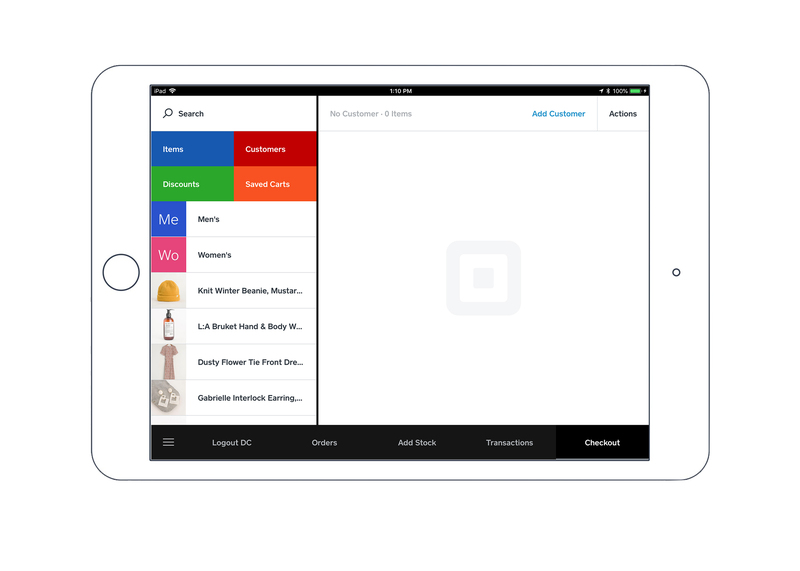 View, draft, send, or manage Square Invoices. 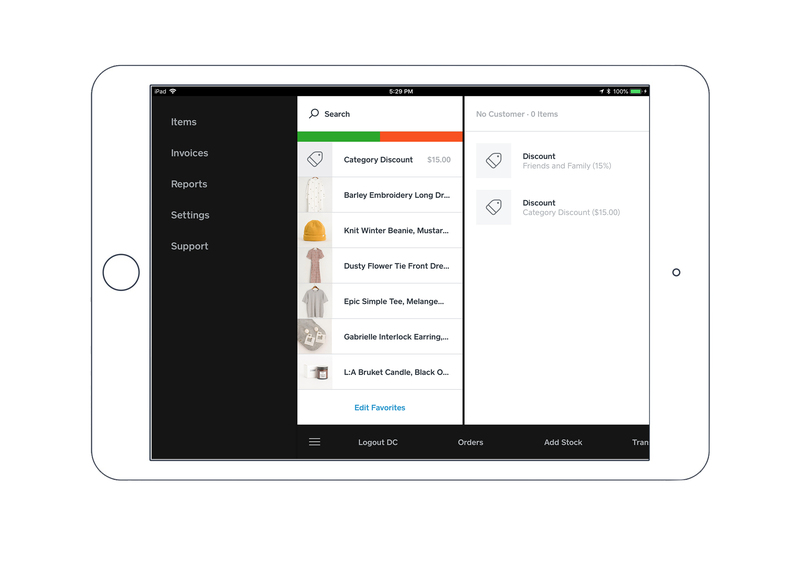 With Square for Retail, you can use Cash Management to help you keep track of cash sales and consolidate your reporting. Current Drawer: Start your cash drawer for the day, pay in/out cash exchanges outside of a transaction, and end your drawer to generate a cash sales report. Drawer History: View the date, time, the employee who ended the drawer, total cash sales, and refunds. Overview of your sales — filter by employee, date, or device to gain insights into inventory performance at-a-glance. Review your deposits from Square. The Deposits tab will reflect active sales, pending deposits, and sent deposits. See a breakdown of your Square Loyalty program. Dive deep into customer analytics, such as the number of customers enrolled in Loyalty, average visits, and the average amount spent per visit. Manage Favorites List: You can add, rearrange, or remove items to your Favorites List. Setup Hardware: Connect or manage your supported hardware. Sign Out: Log out of the Retail app. Specs: Learn about your hardware and software versions. Help: Review our Support Center documentation or contact us on Twitter. Once you’re familiar with the Square for Retail app, you can learn more about processing your customer’s payment.